Why trouble yourself to hold a party at your own premise !!! ? 1. Do not need party rental service - renting of tents, chairs, tables & audio system. 2. 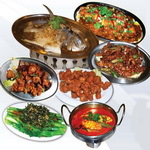 Do not trouble to look for food caterer as our restaurant downstairs is providing the food. 3. Do not worry that you may disturb neighbours. 4. Do not need to tidy up once all the guests have left. 5. Enjoy nice air-conditioning ambience.